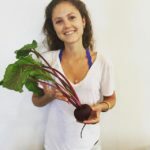 Join Jasmine Silverstein of HeartBeet Foods in this hands-on fermented foods workshop on Saturday, October 27th, from 10am – 1pm at Volcano Art Center Niaulani Campus in Volcano Village! Learn the basics of culturing cabbage and various vegetables into probiotic-rich Sauerkraut, as well how to make your own Kombucha. Each participant will take home their own finished products. This informative and engaging workshop will leave you prepared to make your own ferments at home! Cost for the workshop is $55 and $50 for VAC members. Pre-registration is required. All supplies and Organic ingredients will be provided. No cooking skills necessary, just an interest in real, whole food. Fermentation is an Art not a Science… It’s flexible and fun, not rigid or difficult.